What happens when an unreformed con man falls for his next mark? Lacy Williams’ debut Marrying Miss Marshal was a shelfmate to my first book, so I was happy to read her latest, coming out in December. 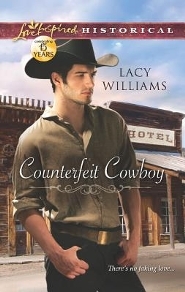 While Counterfeit Cowboy is a follow-on to Marrying Miss Marshal, the book stands alone. In fact, I didn’t realize the two were connected until very late in Counterfeit Cowboy. From the moment Jesse Baker collides with Erin O'Grady on a Boston train platform, he faces a dilemma. For once, Jesse doesn't want to lie about who and what he is. Yet if she learns he's a con artist, not a cowboy—and the urchin with him is certainly not his brother—she'll never give him a chance. Erin suspects there's more to the enigmatic cowboy than meets the eye. But the sheltered socialite is certain his deep compassion is real. On the long Christmastime train ride to Wyoming, hearts and courage are tested and true motives revealed. And the journey that began in a charade may end with redemption—and a very real love. Counterfeit Cowboy is really Jesse’s story in that he has the furthest to travel, and I don’t mean just on the railroads. Jesse has made many mistakes—mistakes that have sucked him further and further into the abyss. Set in 1890, the story begins with fresh-out-of-prison Jesse Baker needing to travel immediately from Boston to Chicago, but he has no money, no friends, no family to speak of. While he’d like to leave his old ways behind, he needs money for train fare. Now. Unfortunately, as a man who spent his life on the streets and in prison, he lacks the knowledge and skills to acquire funds honestly. Earning the money legally—assuming he could even find someone willing to overlook his past and hire him—would take more time that he can spare. And so he determines he must resort to his old scams. But a last minute act of compassion causes him to lose his best shot at a quick hit—and brings him into Erin O’Grady’s sphere. Erin is everything Jesse isn’t: wealthy, honest, a person of deep faith. The two of them, along with an orphan named Pete, set off on a mid-December trek from Boston to Wyoming by way of Chicago. Despite her faith, Erin suffers from the insecurities she developed as an overprotected daughter. Can Jesse truly change, and even if he does, will Erin be willing to forgive when she learns the man in the cowboy costume is just another street hustler? What I liked most about Counterfeit Cowboy is that Williams doesn’t offer an easy solution to Jesse’s and Erin’s dilemma. Through much of the book I had some qualms about Jesse’s transformation and whether I’d believe a happily-ever-after ending for this couple. Without giving anything away, let me just say, “Finish the book.” Williams adequately addressed my concerns by the end. As to whether the counterfeit cowboy ever becomes the real deal…well, you’ll just have to read the book and find out for yourself. Question for you: how difficult do you find it to change the behavior patterns that developed over the years? FIrst, I am happy to hear that you consider this as Jesse's story. I like the variety of not always reading 'the heroine's story'. Boy oh boy, old habits do die hard, and frankly, they also come back to life at times, but we know a true change of heart is possible and is all about love - The Father's love for us, once realized changes our hearts and love for a fellow human being makes it real. Sounds yummy, CJ. Thanks for letting us know about this. Oh those behavior patterns. Yes. It's difficult. Especially the ones that involve how you interact with certain people who have their own behavior patterns. It's not easy at all and requires lots and lots of prayer and willingness. Nice review, and the book sounds like a good read. I love stories with an element of redemption in them. Old behavior patterns...some of mine have to do with patterns of thought. Those are hard to break and, in my case, have taken years of work and lots of prayer! Whoops. Busy writing and forgot to come back this afternoon and check the comments. Deb, while I'd say the POV is pretty much 50-50 in this one, the bulk of the character transition belongs to Jesse, so yes, I'd call it his story. Suzie, an excellent point about how our default behaviors interact with the default behaviors of those closest to us. (Like a spouse, for instance.) Very hard to change because it's so easy to slip back when we see the other person fall back to the same patterns. Susanne, it all does come down to our thoughts, doesn't it?